Galbraith Restored /Monograph/ Ed. by Sergey Bodrunov – St.P. : INID n.a. S.Y. Vitte; M., Publishing house «Культурная революция», 2017. – 372 p.
Fifty years have gone by since the publication of J.K Galbraith’s The New industrial State, а milestone in global socioeconomic studies. 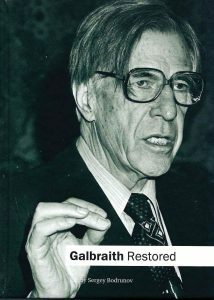 ln this book, Galbraith discussed the role of reindustrialization, mechanisms for the development of а new type of material production, state regulation of market economy, and many other important issues that are firmly embedded the economic agenda of the twenty first century. One of his main objectives was to provide а profound analysis of major problems associated with the industrial economy which has been thriving and, therefore, managed to defy all postindustrial conjectures. Naturally, the industrial economy has changed dramatically over the past fifty years. It has evolved into knowledge intensive material production and engendered the new industrial society of the second generation. Galbraith directly tied the progress of the new industrial economy and planning systems (corporations) to the need for state market regulation by demonstrating the interdependence of the new quality of industry, special role of corporations and public regulation. As we engage in creative dialog with Galbraith in the modern day and age, we rely on his work as а starting point for our own research. This collection of essays comprises articles written by top Russian scholars and, for the most part, draws from their earlier research which reflects decades-long indirect dialog with Galbraith channeled through creative elaboration and evaluation of his ideas and resulting in the development of ingenious solutions to the issues that he raised. Renowned US economist James К Galbraith, the son of John Kenneth Galbraith, wrote the introduction fоr the book.